STORY LINE: FINDING GOLD IN YOUR LIFE STORY is about fictionalizing your truth in your writing. It is for anyone who has a story and wants to learn about the best platform to write their story in. It is a writing book for television and feature writers but also a business, life and spiritual book for anyone who has a desire to learn how to add fiction to their truth and bring it to the page. This book will be out in March of 2011. It is published by Michael Wiese Productions. This interview covers Story Line, Aaron Spelling and the demise of two soap operas. HollyScoop – What’s Your Story Line? There will be a panel discussion titled Finding Your Voice in Story: A Panel Discussion on Writing Unforgettable Characters for the Big and Small Screen. Panelists include; Jen Grisanti, author of Story Line: How to Find Gold in Your Life Story, is a sought-after consultant and a former studio executive who covered Medium, Numbers, Girlfriends, The 4400, Melrose Place, Beverly Hills 90210, Charmed and many other hit series. Pilar Alessandra is the director of the Los Angeles writing program “On the Page, Inc.®.” She’s worked as Senior Story Analyst for DreamWorks and Radar Pictures and covered additional projects at ImageMovers, Saturday Night Live Studios and The Robert Evans Company. She’s trained writers at ABC/Disney, MTV/Nickelodeon, the National Screen Institute, the Los Angeles Film School, The UCLA Writers Program and more. MY STORYWISE SEMINAR: HOW TO TELL A STORY THAT SELLS UCLA – Saturday, March 19th 2:00 p.m. – 6:00 p.m. In this class, we will go over the components of what makes a strong story in TV and features. This will include log lines, drawing from your emotional well, adding fiction to your truth, finding your voice, creating powerful dilemmas and stemming them into clear goals, establishing strong emotional stakes and implementing theme and symbolism. We will look at the top features and TV shows and break down what works and why it works. I will be teaching from my book STORY LINE: FINDING GOLD IN YOUR LIFE STORY. Books will be available for sale after the seminar. Go to my Events & Seminars page to sign up. 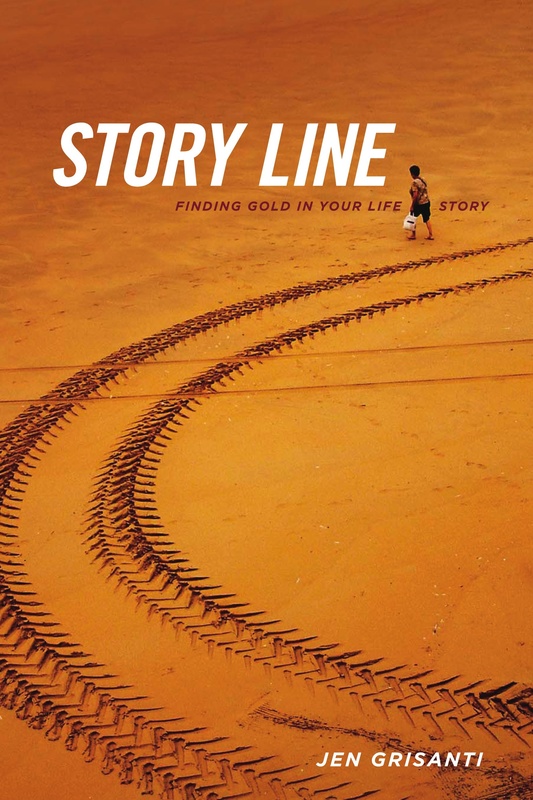 In Story Line: Finding Gold in Your Life Story Jen Grisanti gets to the challenge of writing; we all have something to say, it’s the getting our personal stories on the page, and into the world, that is the hard part. This book helps make that difficult task easier. Story Line is a detailed, well crafted and passionate roadmap to finding our own inner stories and then figuring out how to transform those stories into storytelling. “An instant classic that is going to rock the worlds of a lot of writers in Tinseltown and elsewhere. It has already rocked mine. I know because before I even got halfway through, I was pleading for extra copies to give to my friends. Mark W. Travis – Author, Director and Consultant. Author of “The Director’s Journey”, “Directing Feature Films” and “The Director’s Bag of Tricks.” Lecturer and tutor of film directing in film schools throughout Europe, Asia and America. There are plenty of books that teach you to create compelling characters or outline intriguing plots. But never before has a book focused so successfully on the most important part of writing: saying something uniquely and deeply personal. If you can’t do that, if you have nothing to say, all your wonderful characters and plotting are for naught. Jen’s book takes you to those profound, private places… the only places great writing ever truly lives. Every writer is told, “Write what you know.” But how, exactly does one do that? Jen’s book is the first to take you step by step through the process. By sharing her life experiences and vulnerabilities Jen inspires writers to embark on their own journey of self awareness. This self awareness results in a reservoir of authentic emotional material; the kind a writer needs to create original characters and truly compelling stories. Stories that decision makers buy. As writers, we are often told to write what we know. The meaning of this is often lost on describing the world we inhabit instead of the world which inhabits us. “Story Line: Finding Gold In Your Life Story” reminds you that you are not just telling the story, but that you are the story. It’s one thing for people to advise that you “Write what you know”. It’s quite another to show you how to do just that. Jen Grisanti succeeds in her new book, STORY LINE Finding Gold in Your Life Story. If you’ve ever mused about an incident in your own life and said, “Hmmm, that’d make a great story” – this book is for you. Jen Grisanti brings decades of experience in the highest levels of story development in the Hollywood system and translates it into a very accessible, supportive, inspiring how-to book for writers of any genre, any medium, any level. Generously offering her own experience as examples, she shows how any of us can use our own life’s incidences and emotions to enhance any story. Chapters are arranged along the lines of essential story elements such as Setup, Dilemma, Action, and Goal. Fresh examples from recent TV series and films illustrate her points. The insights and exercises in STORY LINE are dangerous in that they may well shatter the way you’ve been writing and send you in a whole new direction – which would also quite wonderful for you and for your audiences. As an author, I’ve read many books on writing, yet when Jen Grisanti, shared her stories in Story Line; Finding Gold In Your Life Story, it did more than inspire me, it motivated me to write fiction again after two years. The exercises in her book can’t help but get your creative juices flowing and your delicious stories overflowing. Enjoy this book over and over because your stories are always evolving! The inescapable truth about great story and storytelling is that they are always about truth and personal journeys of healing, completion, and becoming whole for authors and characters alike. Jennifer Grisanti gives a disarmingly revealing and well-illustrated path for going to those places in our own experience and creative drives that give tangible life and moving resonance to our stories and characters on the page and on the screen. Just as importantly, she does so by showing the way to access, understand, and authentically fulfill the unfolding story of our lives. While increasing numbers in this business chase the ever moving and ever more elusive curve, Jennifer her growing army of protégés will be among those effectively leading it.